Sheriffs deputies are investigating the death of a 6-year-old boy. RAMONA (CNS) - A 6-year-old boy, left severely disabled by parental abuse suffered as an infant, died at his adoptive family's North County home Tuesday of complications from those injuries, authorities reported. Emergency crews responding to a medical-distress call at the house on Olive Avenue in Ramona pronounced the child dead at the scene shortly before 12:30 a.m., sheriff's Lt. Larry Nesbit said. Investigators learned that the youngster had been a victim of abuse in the city of San Diego in early 2005, when he was 2-months-old, according to police. An autopsy determined that he died from after-effects of a head injury suffered at that time, and his death was classified as a belated homicide, SDPD Lt. Kevin Rooney said this afternoon. In 2006, the boy's father was convicted of inflicting the abuse on him, according to Rooney, who declined to release the man's name. The child's name was changed after authorities removed him from the abusive home, according to Rooney, who said the victim's identity was being withheld "to protect the adoptive family's privacy and the integrity of the current investigation." Homicide detectives with the San Diego Police Department were investigating the death. It was unclear if the victim's father might face further charges in the case. This is the latest information. The original story is below. SAN DIEGO (CBS) - Sheriffs deputies are investigating the death of a 6-year-old boy Tuesday. 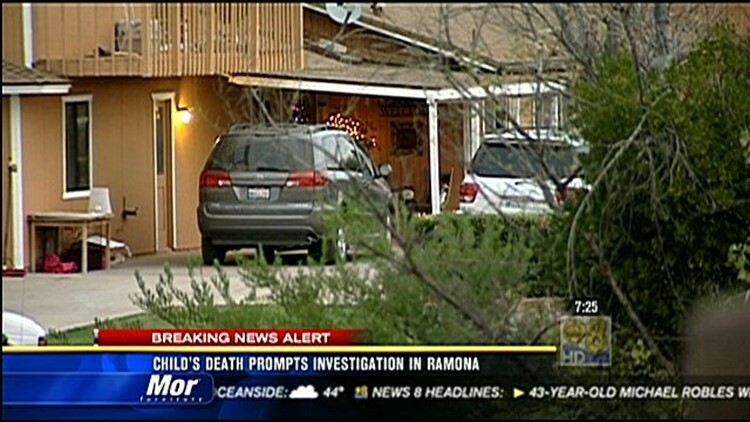 The boy was found dead at a home on the 1000 block of Olive Avenue in Ramona. Paramedics were called just after midnight. They tried to revive the boy, but were unsuccessful. We're told the child had special needs and was chronically ill. The medical examiners office is on scene. We'll bring you any more information as soon as we get it.